Consistent with our recent posts about a likely bounce in the U.S. Dollar and a corresponding decline in the British Pound, we believe the Euro is on the verge of a potentially steep drop. Traders should be prepared, because the drop may turn out to be a strong downward “middle third” wave in Elliott wave parlance. 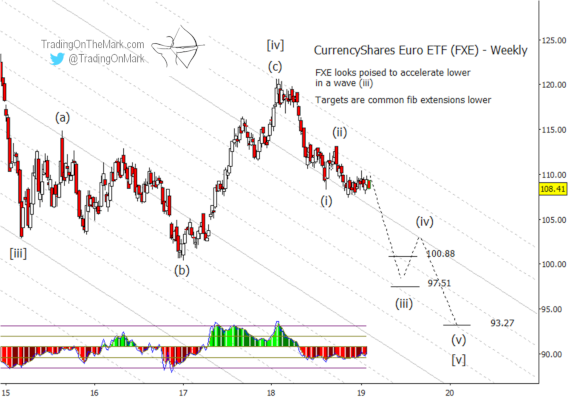 Whereas the British Pound ETF (symbol FXB) made an upward retrace into and slightly above the resistance zone we identified a few weeks ago, the CurrencyShares Euro ETF charted below (symbol FXE) merely consolidated sideways to meet a harmonic line of the downward-sloping channel. Meanwhile the Dollar ETF (symbol: UUP) appears to be gaining upward momentum. If the Dollar breaks higher, we should start to see opposing movement in the Euro. Follow Trading On The Mark on Twitter for more frequent updates about ETFs and futures! Also, readers of our emailed newsletter will receive exclusive opportunities to save on TOTM subscription packages.